HAVING AFFORDABLE GOOD MEALS IN FRENCH RESTAURANTS ? YES, IT IS STILL POSSIBLE . A party of 6 including a 2 year-old boy? Better find a restaurant with spacious surroundings. We were all a bit concerned about eating out in restaurants since our barely 2 year-old grandson was travelling with us during this French vacation. We were wondering how he would react to French food and behave in restaurants where you usually spend more time to eat than in an American family diner or fast-food franchise. And we had no idea how restaurant staff would interact with this young American guest. We thought that it would be better to go to restaurants with him for lunch than for dinner, at a time when he would be tired and perhaps a bit impatient and fussy. And we tried to locate, as much as we could, restaurants with an outdoor ‘’terrasse’’ or patio, where we could let him walk and play around the table if necessary while we finished our meals. We also tried to choose restaurants that would offer simple dishes that may look edible to a child that age, or would have children’s menus. Obviously we were not going to eat in ‘’restaurants gastronomiques’’, or fancy and sophisticated bistrots, the kind I usuallly prefer when I travel to France by myself or with my wife. So, when we decided that the 6 of us would go out to eat, we would rather choose ‘’brasseries’’ (restaurants that serve traditional French dishes from 11:00 AM to 11:00 PM), small local neighborhood ‘’cafés-restaurants’’, pizzerias that in France can be quite good italian eateries serving much more than pizza, and nice small friendly bistrots. We made only one exception when we ate in a very good gastronomic restaurant in Saint-Hippolyte du Fort, that was specializing in regional cuisine. But we went there for lunch during the week when it was not very busy and reserved a table outside in a charming patio overlooking an enclosed garden where he could run around and come back to the table whenever he wanted. This restaurant provided the best meal of our whole vacation. I will come back to it later. - In practically every place we went, even in Paris that for a long time suffered from a bad reputation with American diners, we were always treated in a very courteous, and even sometimes friendly manner, and the service was usually efficient. The staff was most of the time patient, knowledgeable, and professional. Only once, in a Parisian bistrot owned by a famous chef, did we get very poor and unprofessional service. Fortunately, that day, we were only 3 adults eating lunch, and not the 6 of us including the child. And the food was good. I will also get back to this restaurant later. - The prices that were clearly indicated on the menus or on the ‘’ardoise’’ (blackboard) were always the same that we found on the bill. - American Express is now very often accepted in French restaurants and when I used the card as payment in restaurants the exchange rate that they used when billing me in dollars was quite honest. - Many menus had an English translation. - Even though we sometimes took some time to decide what everybody in our party wanted to order, since 3 members of our family did not speak French and we needed time to translate and explain the description of the dishes to them and answer questions, the waiters were always patient and did not push us to order rapidly. Some of them even offered explanations in English spontaneously. - In most places where we ate, we paid more or less the same amount of money that we would have paid in Chicago or San Francisco for an equivalent quality. - We found that choosing the various ‘’prix fixe menu-cartes’’ (a prix-fixe menu with several options for each dish) or ‘’formules de déjeuner’’ (usually one apetizer and one main course dish + coffee or one main course dish and one dessert + one coffee) , that are nowadays frequently offered in many French restaurants, was the best economical solution. It allowed better food options for the best price than selecting different dishes ‘’ à la carte’’. - I have to admit that if you try to translate in dollars the amount that you pay in French restaurants, you will think that prices are higher in France that in the U.S. But it is sort of a false calculation. It is the exchange rate that makes these prices look higher. In fact there were price increases in restaurants since 2005 in the U.S as well as in France. Besides, always remember that in France there are no taxes added and that the service charge (tip) is already included in the price. These two factors put the cost of French restaurant meals at about the same price level as their American equivalent. For example: Let’s suppose that you have a lunch for two, consisting of two courses (one entree + 1 dessert and 1 coffee) with one glass of wine each in a Chicago bistro, let’s say Kiki’s Bistro. It will cost you approximately 60 dollars before taxes. If you add 10% taxes, this amount raises to 66 dollars and after you leave an 18% tip, you reach a total of 78.80 dollars. Now, an equivalent lunch in Paris, let’s say at ‘’Café Constant’’ (see my comments on this restaurant later) will cost you approximately 60.00 euros for two. But with no taxes or tip to add, once you translate that amount in dollars (at an exchange rate of 1.37 dollars for 1 euro), you reach a total of 82.20 dollars for 2 persons. That is only less than 2.00 dollars difference per person. The portions there are smaller than in American restaurants but more than sufficent for a normal appetite. The French, generally speaking, eat more courses during a lunch meal than Americans, but the portions are much smaller. In the ‘’province’’ where people still devote a little more time than Parisians, who are always in a hurry, to their meals, it is not abnormal to have a 4 course lunch. For example, in a ‘’brasserie’’, the first course (called hors-d’oeuvre or entrée) could include some pâtés or other type of ‘’charcuterie’’, or a hard-boiled egg with mayonnaise and a few leaves of lettuce, or some kind of ‘’crudités’’ with a vinaigrette (cold raw vegetables), or some warm goat cheese on lettuce, or shrimps, or snails, or marinated herrings, or a terrine of leeks, or a carpaccio of beef or duck with shavings of parmesan cheese. The second course (called Plats) would include a choice of: Steaks, like ‘’faux-filet’ (sirloin steak), ‘’bavette’’ (skirt steak), ‘’entrecôte’’ (rib steak), or ‘’pavé de rumsteak’’ (a thick cut of steak from the rump) garnished with some kind of potatoes (au gratin, fries, sauteed, mashed, steamed, etc.) and one warm cooked vegetable, like zucchini, cauliflower, baked tomatoes, ratatouille, green beens, petits pois. Or a meat stew like ‘’blanquette de veau’’ (veal stew in a white cream sauce)or ‘’ boeuf bouguignon’’ beef stew in a brown red wine sauce. Or a ‘’ steak Tartare’’ (raw ground beef mixed with various spices, chopped onions and parsley, an egg yolk, and Worcester sauce. Or a ‘’ magret de canard’’ (duck breast). Or an ‘’andouillette grillée’’ with pommes frites (a grilled chitterling sausage with fries). Or a ‘’choucroute garnie’’ (an Alsatian specialty made of cooked sauerkraut in Riesling wine with boiled sausages, hams, salt pork, and other types of deli meats). Or ‘’côtes d’agneau’’ (lamb chops). Or some kind of chicken- based dish like roasted chicken (poulet rôti), chicken in the pot (poule au pot), coq-au-vin, etc. And in a brasserie, you always would be able to choose from some kind of organ meat-based dishes like rognons de veau ou d’agneau (veal or lamb kidneys), foie de veau sauté aux oignons (sauteed veal liver with onions), cervelle (brains), boudin noir (pork blood sausage) served with baked apple, ris-de-veau (veal sweetbreads), or tripes. (bar), salmon (saumon) , skate (raie au beurre noir) sauteed in ‘’beurre noir’’, scallops (coquilles Saint-Jacques), or large shrimps (scampi). Most often this seafood dish would be served with boiled or steamed small potatoes and fresh cooked vegetables like asparagus, spinach, zucchinis, fennel, or even fresh pasta. Often, a little side dish of lettuce seasoned with a vinaigrette could be part of the main course. The third course (fromages) traditionally is made of a single, or 2 or 3, pieces of good AOC cheeses such as Camembert, Brie, Cantal, Roquefort, some kind of Chèvre, Saint Nectaire, Reblochon, Munster, Pont- l’Eveque, to only mention those most frequently served in brasseries. Sometimes you can order a larger selection of several cheeses, from ‘’ Le plateau de fromages’’ (the cheese tray). But this offer is more common in full-service restaurants and good bistrots than in café-restaurants and brasseries. The cheese course can vary according of the region where you are, where only local cheeses can be served. The fourth course is dessert. All brasseries offer a choice of fruit tarts, fresh fruits, ‘’flans’’ (custard), crème brulée, mousse au chocolat, sorbets and ice-creams, nougat glaçé, profiteroles. Fruit crumbles have become very popular. We had a very pleasant meal in such a very traditional brasserie, the Brasserie du Boulingrin in Reims, a city of 200.000 people 90 miles North-east of Paris which is the capital of the Champagne district and has one of the most beautiful gothic cathedrals in the world where kings of France were crowned. We were in Reims for a one-day family reunion at my brother’s house, an old 17th century farm located in a small hamlet at the heart of the Champagne vineyards. This beautiful and very lively art-deco brasserie with is authentic frescoes on the walls, big mirrors, and confotable banquettes (leather seats) has been in the same spot, near the old food market hall, since 1925. When I lived in Reims from 1947 until 1958, I never had a chance to eat there since we did not eat in local restaurants. The 6 of us just wanted to have a quick lunch on that very grey and rainy day before driving back to Paris, since we had been eating a lot of food and drinking several bottles of champagne and wine the day before. And as in well-managed brasseries, we were promptly seated and, the time to study the menu and to order one main dish each, we were served relatively fast when we told the waiter that we did not have much time. The quality of the 9 oz (265 grammes) faux-filet was very good. It was served as ordered ‘’à point’’ (medium-rare) on a wooden board and served with a roquefort sauce on the side and a very good ‘’gratin dauphinois’ (potatoes au gratin in a cream and cheese sauce) at a cost of 18.50 euros (25.50 dollars). The ‘’côtelettes d’agneau’’ (lamb shops) were nicely trimmed, meaty and very tender and juicy. At 16 euros ( 22 dollars) for 2 pieces, they were served on an individual wooden board with some ‘’modern’’ ratatouille (meaning reconstructed as a cube made of several slices of vegetables without a sauce), and gratin dauphinois. The ‘’magret de canard et son jus de romarin’’ (duck breast with a natural rosemary jus) was also very attractively presented, very flavorful, and once again was served as ordered (medium-rare) with gratin and ratatouille. A ‘’plat du jour’’, special of the day, was a filet of pike in a champagne sauce with mushrooms and little shrimps. At 17.50 euros (24 dollars) It looked very good but did not pleased my older son too much who was looking with envy at his brother’s steak. I had half a roasted ‘’coquelet’’ in tarragon sauce (cornish hen) that was good but not worth lengthy comments, for 9.50 euros (13 dollars). The last dish, at 16 euros (22 dollars) was a very well cooked filet of bass sauteed in olive oil with tomatoes and herbs. We ordered some very tasty home made ‘’pommes frites’’ (fries) for my grandson, and he seemed to enjoy this 2 euros treat. With a bottle of Côtes de Provence and a litter of Vittel water, the total bill for 5 was 103 euros (141 dollars). One might consider that a bill of 28 dollars per person is relatively expensive for just one course lunch with a glass of wine. But it was a nice, well managed and traditional restaurant, not a hamburger joint . In fact the average client was a well-dressed local businessman. You can find more complete lunches for less money in smaller and little less classy places. For exemple, the day after our arrival in Sigalas, a Sunday, we decided to find a modest little restaurant in Saint-Hippolyte du Fort where the six of us could have a cheap but substantial lunch. I remembered such a little place with an outside terrasse, near the Temp le, this is what a protestant (calvinist) church is called in France. Saint Hippolyte's temple is one of the two largest in France, the other one being in the small town of Anduze, 18 miles away. My father was the minister of this temple from 1937 to 1947. This restaurant is called ‘’Les Cévennes’’, the name of the nearby mountains. We were seated outside and could observe the activities of local young men racing each other and doing acrobatic moves on their noisy small motorbikes. The restaurant, owned by a family, whose customers were mainly local regulars, had "prix fixe menus" at 18 euros that included 3 courses. First they brought some complimentay ''amuses-bouches'' that included a very good home-made tapenade, and some ''popcorn''. As first courses we had various local country pâtés and sausages, warm ‘’Pélardon’’ des Cévennes (goat cheese) on a mesclun of lettuce, and mountain ham. My wife had a very tasty warm dish of eggplant baked in a meat tomatoe sauce. As main courses, we ordered entrecôtes (rib steaks) in a cream sauce, a duck breast in a apricot and pepper sauce, and lamb shops. They were all pretty tasty and garnished with fried eggplant, tomatoes and zuchinis, or fries, or provençal (oven-baked with garlic and thyme) tomatoes and green beans.For the third course we had a choice of either cheese or desserts, that were traditional: pear tart, chocolate mousse, ice-creams and sorbets. With 2 bottles of locally produced good rosé wine, two bottles of mineral water and a glass of milk, the total bill was 120 euros (165 dollars) for 5 (+) persons for full, not gastronomical, but well prepared meals. In Paris we had lunch in one of my favorite “café-restaurant”, “A la Tour Eiffel’’, rue du Commerce in the 15 th arrondissement. I love this place where, when I arrive in Paris usually on a Saturday, I have my first lunch with the friends I stay with. They live in a house rue du Commerce. And before I went to CDG airport to catch my flight back to Chicago, when it was still leaving from Paris in the middle of the afternoon, I used to have a last solid French lunch there too. It is one of these typical neighborhood cafés, owned of course, like many other bistrots in Paris, by people from the " département'' of Aveyron. They have a traditional zinc counter where local people, shop-keepers, and delivery truck drivers, or tourists, stop by to have a drink, eat a sandwich, or have a quick breakfast in the morning. But it has two small dining areas, one in a sort of low mezzanine with ‘’banquettes’’, and one at street level with the traditional bistro tables covered with white paper cloth, where they serve lunch, mostly to regulars. It is a very lively scene with very busy and friendly waiters and one waitress running back and forth between the kitchen, the bar where they order wine and aperitifs, and the tables of their customers, often zigzaging between coming and going patrons, with their platter full of smoking plates in a precarious balance up on their extended arms. In the summer time the French door-windows open to the street sidewalk where a few tables allow you to have a drink or eat a sandwich in the sun, facing the church. The decor is very simple but quaint, almost provincial, and could be part of the set of a French film, with its old photos of the Eiffer Tower at various stages of its construction on the smoked yellowish walls, an antique radio set, and some old mirrors. The mix of sounds from the conversations of customers s and from the exchange of orders between the staff, the bar, and the kitchen are also very typical and picturesque. My two sons and I started with traditional ‘’oeufs durs mayonnaise (hard-boiled eggs with mayonaise on lettce), jambon cru d’Auvergne (raw dried ham from Auvergne), and pâté de campagne (country pate). The ladies did not order appetizers, and we ordered some very good frites and haricots verts au beurre (green beans sauteed in butter)for my grandson. Then we had ‘’confit de canard aux pommes sautées à l’ail’’ (a leg of duck confit with potatoes sauteed in duck fat with garlic), entrecôte frites (rib steak with fries), roasted farm-raised chichen with mashed potatoes, and a steak with a peppercorn sauce and fries. For dessert the ladies had a very tasty and smooth mousse au chocolat, and my two sons shared a pear sorbet doused with eau de vie de poire william (bartlett pear brandy). I had a marvelous piece of ‘’entre-deux’’ Cantal cheese . With a bottle + ¼ of a litter of red Marcillac, a wine from Center France, a bottle of Vittel and a glass of milk, we paid 121 euros (65 dollars) for 5 adults and one child. And it was a very good, simple and almost slightly rustic, Parisian lunch. I was however very surprised to read on a special blackboard on the wall the geographical origins of the meats served that day in the restaurant: The entrecôte was from Germany, the ‘’onglet’’ from Holland, and the ‘’Pavé’’ and chicken from France. I do not know where these new European rules and regulations are taking us, but I do not feel comfortable with this kind of info. It sort of spoiled my appetite. Let’s return to the nice traditional sources of beef in Charolais or Salers. Once, my wife and I decided to go by ourselves to the Camargue,a beautiful wild marshy area in the Rhône delta where this river ends its long run that starts in the mountains of Switzerland, into the Mediterranean sea, near Arles. It is a fabulous landscape full of thousands of wild birds and white horses. You can also see the famous bulls that are raised there to be used in bull races and special events all over South of France. We love this area and the charming little coastal city of Les-Saintes-Maries-de la Mer, which is the site of an annual pilgrimage for Gypsies from all over Europe. We also wanted to have lunch in the nearby old fortified small town of Aigues-Mortes built in the 13th century where St Louis left for the Crusades. The town is entirely enclosed between high walls dominated by a famous tower, La Tour de Constance, an old state prison where a group of very courageous Huguenot women were imprisoned in the 18th century. Among them, Marie Durand spent 38 years there and engraved the famous ‘’resister’’ (resist) word in the stone of their cell. It was a sunny and warm day and we had a great lunch, outside on a small patio in the street at ‘’ La Guinguette de la République’’ a modest but very pretty bistrot in the charming Hotel des Templiers, that I recommend to anybody who wants to spend a couple of days in that area. La Guinguette is owned and managed separately . This place, away from the main streets that are packed with tacky tourists at this time of the year, was quiet and restful. The owner, or manager, was obviously the only staff that day, except for the chef of course, and was a very discrete but helpful and gracious host. He was willing to provide interesting pieces of info about the way they prepared some of the delicious, very Mediterranean dishes that were simple but sophisticated from a taste and presentation standpoint. For the first course my wife had a ‘’mandarlate’’, a very colorful and complex dish, that we understood was an old recipe from the Italian family of one of the friends of the restaurant. It was a mix of ‘’confiture d’oignons’’, dry raisins, red peppers, almonds, very slowly cooked for 6 hours and deglazed with balsamic vinegar. The combination of flavors was positively unique and stunning. I had beautiful ‘’aubergines provençales’’, ultra-thin (they used a ham slicer to have them perfectly cut and shaped ) and lengthy slices of eggplant, lightly fried in olive oil, and artistically pr esented in a small portion of very aromatic pureed tomatoes. As a main course, She had lamb chops, perfectly grilled and served with an unctuous and very tasty purée de pommes de terre à l’huile d’olive (mashed potatoes in olive oil). I had a spectacular home-made canneloni, that will remain in my memory as one of the tastiest I ever ate. She had a very well-made apple crumble for dessert, and I drank a fragrant italian expresso. I will not hesitate to go back there the next time I travel through this area. Also in Paris, I wanted to go to a place that I had never tried before during my numerous trips to Paris. So my wife, my younger son Theo, who loves to eat too, headed to Rue Saint Dominique, in the 7th arrondissement, to have lunch at CAFE CONSTANT. Christian Constant is probably one of the most well-known and respected Parisian chefs who has trained some of the most successful young chefs of the new generation that started to open their own restaurants in Paris in the late eighties and mid-nineties, when he was the chef of the famous restaurant of the Hotel Crillon, Les Ambassadeurs. Some of these very successful chefs are Eric Fréchon, at the Bristol, Yves Camdeborde who got famous at La Régalade, Alain Péguret at Laurent. Constant has now 4 restaurants on the same sidewalk of Rue Saint-Dominique within one or two blocks: The very good Violon d’Ingres, his flagship, Les Fables de la Fontaine, Café Constant, and the latest one that opened in June: Les Cocottes. Café Constant is a simple unpretentious neighborhood café-bistrot with a street-level room that is really lively and populated by regulars, many from the neighborood. It has a traditional ‘’zinc’’ (bar) and some pleasant ‘’banquette’’ seats where you can relax while eating and watching people come and go. The waitress downstairs is very competent and seems to know her regular customers. This is where you should eat if you do not mind the smokers. We went to the small smoke-free room upstairs and that was our mistake. As a waiter, we had a young man, poorly shaved, dressed in a not too clean tacky soccer T-shirt and jeans, who did not know how, or was not willing, to explain anything from the menu that was on a blackboard that he carried around. He did not seem eager to communicate in any way with us, was totally aloof and unconcerned, and was very slow to react. Obviously he had not been trained properly for this job, and we were very surprised by his unprofessional attitude, a rare occurence in a Parisian restaurant owned by a respected professional chef. As a first course my wife had a ‘’millefeuille de tomates’’ that was in fact just a small mount of a few slices of very good tomatoes sandwiched with 2 or 3 slices of fresh mozarella cheese and toped with two leaves of fresh basil. It was O.K but she expected something more sophisticated with some puff pastry layers and it was not worth its price of 10 euros. The waiter did not explain anything about this dish when we ordered it and asked him about the “millefeuille” component. I had an excellent home-made ‘’terrine de foie gras’’ that was very well prepared, smooth and subtle, that was well worth its 12 euros. My son enjoyed his ‘’salade d’artichauts’’, a very refreshing and nicely seasoned salad of fresh artichoke bottoms and mushrooms that was also priced at 10 euros, an appetizer made from first rate products. Our main courses were very good: My son and I had very tasty ‘’escalopes de canette’’ (scalopini of youg duck breast), served with two types of young potatoes from Noirmoutiers (an island on the Atlantic coast that is famous for its potatoes): one mashed and very buttery, the other ‘’ rissolées’’ (gently pan-sauteed) priced at 14 euros. I could go back there just for the exciting taste of these potatoes. My wife, as usual, had ordered ‘’côtelettes d’agneau’’ (young lamb chops) served with fresh small green beans, also for 14 euros. The quality of the meat and the ‘’temps de cuisson’’ (cooking time) were perfect. I had a cheese plate including a delicious and perfectly aged Saint-Nectaire fermier and a very fragrant small chèvre for 7 euros. My wife has a decent sorbet, half mango, half black currant, for 7 euros. And my son’s ‘’profiterolles’’ with a warm chocolate sauce on the side, also at 7 euros, were scrumptious. With a very good bottle of Bourgueil at 24 euros, half a bottle of an excellent Lalande de Pomerol, and one liter of Thonon mineral water (a very good water, much better in fact than its famous neighbor from Evian), the total bill reached 139 euros for 3. (190 dollars). I found it a tiny bit overpriced for such a modest but good cafe-restaurant, but the meal was very satisfying overall. Perhaps you pay a little extra for the name. We did not see Monsieur Constant but we understand that he comes very often to have a late lunch downstairs. Also I read that most of the warm dishes are prepared in the kitchens of the nearby Violon d’Ingres and brought by a runner to the cafe. The name, in case you wonder, has nothing to do with ‘’amour’’ (love). It is an old occitan word for mûrier (mulberry tree). This type of tree was very common in the area of Saint-Hipolyte du Fort, a town that for two centuries was well-known for its production of natural silk. The silk worms in order to become cocoons had to feed on the leaves of these ‘’murier’’ trees. As a matter of fact, Pasteur lived for a while in Saint-Hippolyte when he was trying to find a way to eradicate a terrible disease, the Pebrine, that affected the silkworms and practically destroyed for a while the silk industry in that area. The production of silk was the main industry of the Cévennes region until the end of the 19th century. Nowadays, you can visit a very informative ‘’ Musée de la Soie’’ (Silk Museum) in Saint-Hippolyte. You reach the rustic but confortable, very sunny, air-conditioned, main dining room, with high ceilings and wooden beans, nicely appointed with provençal-styled furniture, through a beautiful garden full of interesting trees, plants and flowers. We had reserved a table outside in a shaded patio covered with a ‘’tonnelle’’ that, in the summer time, provides a natural resfreshing shield against the very warm rays of the Southern sun. The owners, Mr and Mrs Mathis, are very professional and gracious hosts and they did everything they could to be informative and helpful while we ordered as well as during the meal when I asked questions about the way they envision their type of ‘’mission’’ as serious restauarteurs proud of French and regional traditions, about their local suppliers, and about the regional wine producers they buy from. The chef is very proud of his buying the best products from local farmers and meat and fish suppliers, and the fact that his menus reflect what is available in each of the four seasons. I believe that he forages himself the wild mushrooms and herbs that he uses in his very aromatic cooking. The restaurant offers 4 different menus from 19 euros (Menu Tradition) to 39 euros (Menu du Chef) + a little children's menu at 12 euros. We opted for 2 Menus du Terroir at 26 Euros and 3 Menus de Saison at 26 euros. We started with a complimentary colorful amuse-bouche made of three different layers of red pepper, eggplant, and zucchini mousse, served in small antique glasses. In the Menu du Terroir the first course was a ‘’millefeuille de panisses marseillaises, tapenade, et sauce provençale’’, a Napoleon of fried tiny cakes made of chickpea flour,sandwiched with olive and capers tapenade, with an herb-seasoned provençal sauce based on a tomato-based kind of coulis. Absolutely flavorful. The Menu de Saison offered, as a first course, a spectacular home-made “foie gras mi-cuit au torchon”, with roasted fresh figs, and black Java Hawai granulated salt. My two sons loved every gram of it. 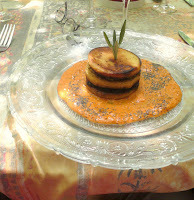 My daughter-in-law had a ‘’papeton’’, a typical provençal specialty, which is a round molded cake of small fried and pureed eggplant with a tomato coulis and fresh basil. Beautiful to watch and very tasty. The main course of the Menu de Terroir was a ‘’charlotte d’agneau en habit d’aubergines’’, a ground lamb and eggplant sort of crustless pie, that proved to be full of subttle mediterranean classic flavors. In the Menu de Saison, my daughter- in- law had an artistically designed “fan” of duck breast surrounded by peaches preserved in Xeres wine. The other choice, enjoyed by my two sons, was roasted leg of lamb encrusted with Java pepper, a very original rendition of this classic lamb preparation. Both menus offered a plate of cheeses, that were mainly local goat cheeses including the famous ‘’Pelardon’’ des Cévennes. The dessert in the Menu du Terroir was a custard pie made of very flavorful chesnuts grown in the local Cévennes mountains. I normally hate custardy cakes and do not like chestnuts too much, but eating half of this silky and voluptuous dessert plunged me in some kind of rapture. An other dessert from the Menu de Saison was a slightly spicy carpaccio and sorbet of fresh pinneaple, with tiny dices of papaya and an etheral foam of coconut. The presentation was beautiful, and this dessert, from what my daughter-in-law told me, had a very original and exciting combination of flavors. Ther was also a ‘’parfait’’ (a mousse-type of ice-cream) flavored with fresh mint from the restaurant’s garden, with a ‘’coulis’’ of exotic tea, with a touch of chocolate. Little Sébastien seemed very happy with his macaroni and cheese. (5 euros). We drank 2 bottles of a very exciting and very aromatic Mas Bruguière rosé, from the nearby AOC of Pic Saint Loup. A pure pleasure and a bargain at 20 euros a bottle. And of course a couple of bottles of Evian. With a total bill of 199 euros (272 dollars) for the five of us and the child, we left this restaurant with the very happy and comforting feeling that you could still find very satisfying, creative meals, well-crafted by professional chefs who love their art, in French restaurants for a very decent price. Our discovery of the year in Nîmes, 300 yards from my old High School. Very pleasant staff. We ate outside in a ‘’terrasse’’ literally in the street,with people walking by, but it was very nice and relaxed. Very good “Reine” pizza with ham, mushrooms and cheese. They also make a great fettucini with home-made pesto sauce, that both Sebastien and I loved. Excellent Domaine de Gournier rosé. A vin de pays du Gard that I discovered... in Chicago. Quite affordable and enjoyable experience. We have have been eating in this modest but much ‘’sympathique’’ pizzeria since my wife and I moved to the Saint- Germain des Prés area in the mid sixties. And in 2007, 40 years later, the place is owned by the same Italian people who still shake my hand when I come in, even if they did not see me for 2 years. The pizza is always the same: hand shaped and cooked individually in the same old wood-burning oven that they had in May 1968 when we were running away on nearby Boulevard Saint-Germain from the charges of the CRS (riot police). It is located practically across the Saint-Germain-des-Prés church. As before, nothing to write home about, no fancy food or creative dishes. But we still enjoy the good “Quatre saisons”, “ Reine” and plain “Margarita” pizzas. The check is easy to pay. AFTER TWO WEEKS OF FOOD-SHOPPING IN FRANCE, I AM ASKING MYSELF THIS QUESTION: IS THE AVERAGE FRENCH PERSON STILL REALLY INTERESTED IN GOOD FOOD AND WINES? I AM NOT TOO SURE WHAT THE CORRECT ANSWER SHOULD BE. On July 14, at 8:30 AM our Air France flight from Paris to Chicago landed on time after an uneventful and very peaceful ocean crossing. We were on our way to a week of vacation in a house rented in a small hamlet of 4 houses, SIGALAS, 5 miles South of Saint-Hippolyte du Fort, in the département du Gard, 25 miles north of Montpellier. I was quite anxious to get back to this area of ‘’ Saint-Hippo’’ where I grew-up between 1940 and 1947. Over the last 37 years, since I moved from Paris to Chicago, I had a few occasions to drive through, or make short stops in this sleepy little town of 3,500 souls. But it was really the first time since I moved with my family to Reims in 1947, that I was going to be able to rediscover the place where I lived during most of World War II. Besides, we have very good friends who have their summer home a few miles from there, in the village of Lasalle, in the mountains of the Cévennes, a house that I visited hundreds of times since the early sixties, and I looked forward to going back there to visit with them. I thought that maybe I would have a chance at their place to enjoy again the marvelous country chicken liver-based pâté made by their local butcher, as well as some dry pork sausage, and dry air-cured ham from those same mountains of Cévennes that I love so much. Disappointing first re-acquaintance with French food: A mediocre meal on Air France and so-so croissants at the Paris airport. We had to wait 3 hours at CDG (Charles De Gaulle) airport in Paris before we could catch our connecting flight to Montpellier, where rented cars were waiting for us. And since we were very hungry we decided to look for some croissants and we found some in one of the food counters at the airport. The decent champagne, Jacquart, as well as a drinkable French red vin de pays d’Oc were free in our economy class cabin, but the food, prepared in Chicago was at best mediocre and we practically limited ourselves to eating the lone portion of industrial-type camembert with some bread that was served on our dinner trays. Food used to be very good, even in economy, on Air France 15 to 20 years ago. And it is still better than what you eat on the competing American airlines. But obviously this good company does not spend a lot of time, money, or decent products to prepare meals on Eastbound flights. Most components on the tray were in fact American. The meal on the way back was much better, but still not very exciting. So these croissants that we found at La Brioche Dorée, a well-known franchise of ‘’croissanteries’’ shops, were welcome. But they were not as good as I remembered them to be: a bit too soft with a slightly mushy dough, and I have some serious doubts about the amount of real butter that they used to make them since they were not that flaky. I was told later than most industrial croissanteries produce this kind of tasteless and sort of soft croissants nowadays, that do not even have the well-defined crescent shape and exterior golden crustiness of croissants that you find in good artisan bakeries. But we were hungry and ate them with gluttony. My first shopping trip to a French hypermarket. What an incredibly wide choice of products and brands. But it takes time to buy intelligently, and you better have a precise food budget in mind. Since July 14 is a national holiday in France (The ’’Fête Nationale’’ that Americans call Bastille Day and the French, more matter-of factly ‘’Le Quatorze Juillet’’) every store was closed. But I had done some preliminary research on the Internet in Chicago and I had found out that a very big Hypermarket from the CARREFOUR chain, that I already knew from previous vacations in the Montpellier area, would be open until 7:00 PM on that day. So as soon as we had unloaded our bags in the delightful ‘’mas’’ (a word defining any rural small house in Provence and Languedoc) that we had rented in Sigalas, I drove back to CARREFOUR in the outskirts of Montpellier to find enough food and drinks so that the six of us could eat and drink nice things until Monday morning when the SUPER-U, the only supermarket in Saint-Hippo, would open its doors. My visit to CARREFOUR was a real eye-opener to the present state of the food-supply chain in France. Also, I had forgotten that the size of French hypermarkets is more than three or four times the size of your regular local supermarket in the U.S. It is more like a mix of WalMart and Costco. Therefore, it took me 1 hour and 30 minutes to buy everything I needed (food, water, detergents, wine, bread, baby-supplies etc. ), plus a few extra food and wine items that I did not need but I thought would be enjoyed by the all family after such a long trip. In fact, I projected my own ''gourmandise'' into the real basic needs of an exhausted family after this long trip from Chicago and California to Sigalas. But they soon forgave me. I knew that I should not think this way but every time I was about to select a product I would mentally convert the price in dollars and the result would be so annoying that I would then try to choose a less expensive item in the same family of products. No wonder it took me forever to accomplish a basic first-day grocery shopping trip. I was quite impressed by the very wide choice of various qualities and brands for one single food product. But after a while, a sort "who cares about the price... it's our first day of vacation in France'' prevailed and I relaxed a little and continued my shopping spree in a more '' French" way. In the refrigerated shelves of meat and deli products there were at least 15 different types, for each kind of product, of pre-packaged hams (prepared in all kinds of ways, with fat and rind or not, oven-baked, dry-cured, ‘’au torchon’', etc. ), sausages, pâtés, cured meats, steaks, etc. And then there was a special counter where bouchers (butchers) and charcutiers (cured meats and deli clerks) would cut and slice for you the same kind of products, but from the whole piece and usually from better brands or selected regional specialties. This is why I bought pre-packaged ‘’ jambon cuit au torchon’’ from the refrigerated shelves, but slices of ‘’pâté en croûte’’ and ‘’terrine de canard au foie gras’’ from the fresh charcuterie department. The bread that I bought that night at CARREFOUR, a ‘’baguette rustique’’, was barely edible. But it was the end of the day and therefore it was normal for the crust not to be crunchy anymore. But the price of a ‘’baguette’’ was quite cheap, around 80 centimes (68 cents). The ham was excellent, much better than its American counterpart, for about the same price or less. But I had selected good well known brands, with limited amount of processing, fewer additives, leaner cuts, rather than generic house brands or cheaper products. The pre-packaged fresh chickens that I bought in super markets, bearing the ‘’ label rouge’’ that is supposed to indicate a better quality category of poultry, and clearly indicates its area of production in France, in this case the ‘’Cévennes’’, were supposed to have been ‘’cage free’’, free of antibiotics, and mainly grain-fed. I do not know if all those qualities printed on the label were the truth or not, but these fresh chickens were very meaty, tasty, and much more flavorful that their counterparts from ‘’Whole Foods’’. But they were about 3 dollars a piece more expensive than their American cousins. I bought the best quality of fresh eggs, from Loué, that I could find on the shelf. They were super-good,with large nice colored yolks, but very expensive: the equivalent of 5.17 dollars for a carton of 12 eggs. The fruits and vegetables, whose country or region of origin were clearly indicated on the signs affixed on the shelf, were OK, but not great. But they were a little bit less expensive than their equivalent in the U.S. You find much better fruits, especially from local producers in the South of France, at smaller points of retail and at roadside fruit stands. Locally grown peaches that we bought from one of those roadside stands were very juicy and flavorful. But in supermarkets, even in South of France which is an area of production, you often find tomatoes, red peppers, or zucchinis that are produced in other European countries, and are not as good as the local fresh produce. Obviously they were harvested too early and sent by trucks to refrigerated distribution warehouses before reaching the French supermarket. I am far from being one of these anti European integration grumpy Frenchmen, but I have to admit that one of the most depressing results of the opening of the French local markets to produce and fruits grown in other countries that are members of the European Union like Holland, Germany, Spain, or Poland, is that the average quality of fruit and vegetables in French supermarkets has become very unpredictable. Good French locally-grown vegetables and fruits, even during the summer, are often difficult to find in large supermarkets, even in South of France. No such problems with regional wines at CARREFOUR or SUPER U. Good bargains were abundant in the well-supplied wine departments of these stores. I could buy very pleasant red and rosé wines from regional AOC’s (Appelation d'origine contrôlée) like Fitou, Sant-Chinian, Corbières, Minervois, Costières, Pic Saint-Loup, etc., for 3.00 to 4.50 euros (4.11 to 6.16 dollars). Local vins de pays could be found for even less than 4 dollars a bottle. I found some decent wines produced around Saint-Hippolyte, like the Salles de Gour, for less than 3 euros at a mini-mart downtown St. Hippo. But once again, I noticed that many people, especially the younger ones, did not seem to know much about wines when they had to purchase a bottle and were facing the well supplied racks in the store. Quite often they would end-up buying a mediocre cheap wine from a ‘’négociant’’, because they recognized the brand name from an advertisement , rather than a decent ‘’vin de pays’’ from a local vineyard owner. Obviously, the younger generation does not drink much wine , or at least does not seem very interested in wine. A pity. But they sure enjoy beer. The greatest source of temptations and food budget destruction remains the cheese department. There was an enormous selection of butter, cheeses, and yogurts (the French consume a large amount of yogurts), of every possible denomination in their pre-packaged form on refrigerated shelves. But it was in the fresh cheese department, where cheese mongers would slice, weigh, wrap, and price the items that you either selected yourself or asked them advice about, that you would find an attractive, but more expensive, selection of better AOC and regional cheeses, as well as various fresh beurre en ‘’motte’’ (lump butter). There are also AOC classifications for some cheeses certifying that they are prouced in a specific region. The Cantal, Saint-Nectaire, and Bleu des Causses (a regional blue cheese from the Cévennes Mountains), that I bought for 12 euros (for the 3 pieces) were quite edible, but not as good as the similar cheeses I buy in my small family-owned ‘’fromagerie’ on the Rue du Commerce in the 15th arrondissement of Paris. They had a very extensive selection of blue cheeses from various regions, and their choice of goat cheeses, one again in various shapes and styles, was impressive. But most of them were not adequately ''affinés'' (aged). This only category where the choice was limited was AOC Camembert au lait cru and Brie. Perhaps because the demand is more limited in the South of France than, let's say, in Paris. Speaking of cheese, I made an interesting discovery on that first shopping trip, that confirmed what I wrote about on this blog several months ago: Some producers of AOC real camembert from Normandy, sell not only the traditional camembert au lait cru (raw milk camembert), that you find in the specialty cheese department, but also an other variety called ‘’camembert de Normandie au lait thermisé’’, meaning that the milk they used in this camembert has been heated a little bit more to kill potential bacteria and extend the shelf life of the cheese but without reaching the point of ‘’pasteurization’’ that eliminates part of the original true flavor and character of the authentic AOC au lait cru. These camemberts thermisés are found in the refrigerated sections and are surprisingly quite decent. I bought two of them made by some of the better known producers, LANQUETOT and LEPETIT, after making sure after reading the expiration date on the side of the box that they would be almost ripe, and I was not disappointed. Besides, the camemberts thermisés from AOC brands were actually quite cheap: about 2 euros a piece (2.74 dollars) much cheaper than the 9.99 dollars I pay in Chicago for a Le CHATELAIN, a good but pasteurized camembert de Normandie, made by the giant LACTALIS group, that also owns LANQUETOT. But I noticed that most people bought cheaper pasteurized, non AOC, camemberts, quite often with a generic brand label. A shame.. I was also sad to see that many young people bought packs of sliced processed cheese, Kraft-style, and bland creamy industrial cheeses, rather than traditional regional varieties. I could not believe what young French people eat and drink nowadays. As a matter of fact, in most small restaurants where we ate, it was mainly people in their late forties, fifties, and sixties who were ordering wine. The younger diners drank mineral water or Coke. 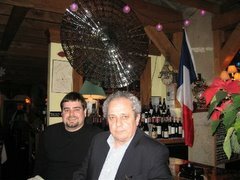 I think that the very strict enforcement by the French police of laws against DUI driving, that can deprive you very quickly of your driver’s license if you are caught driving with a blood alcoholic content superior to what is accepted, has also seriously diminished the consumption of wine and spirits in restaurants. But in small towns and rural areas people still seem to enjoy spending time drinking their ‘’aperitifs’ (before lunch or dinner drinks) while sitting and talking with friends at the terraces of cafés and bars. Otherwise the South of France would have lost one of its biggest, joyful, and charming traditions. What really surprised me the most was the fact that you did not see many young people buying their cheese, or ham, chicken or meat from the specialty counters but from the shelves in the pre-packaged form. The few people that would buy from the cheese monger, the butcher, the fish monger or the deli counter in super and hypermarkets, both in Paris and in smaller towns were most of the time over 40 years old. The same is true in smaller family-owned food and grocery shops. Their customer base there is adult or mature. And I was horrified to observe the way young people, single or couples, in the 25 to 38 age bracket, shop in supermarkets. I thought for a few minutes that I had been transported back to the U.S. They rush their carts between the aisles and fill them out rapidly, without taking the time to compare products, quality, or prices, with mostly pre-packaged food, often frozen. They also buy lots of ice cream products, frozen cakes, and candy bars. They seem to drink lots of beer, coke, sodas, mineral water, and juices but, as I said earlier, very little wine. They also buy lots of pizza, often ordered from the local Pizza Hut. Obviously cooking traditional French meals is not their cup of tea. And for lunch most of the time its a sandwich or some fast food with a coke. The Mc Donald’s and other fast food franchises, American or French, are always packed. By the end of our trip, I was seriously concerned about the transmission to future generations of the traditional French cooking and wine drinking heritage and traditions, after observing the way contemporary adolescent and young adults eat in France . And they even copied that bad American habit: eating lunch or dinner in front of a video game or while watching TV. The cover of a French popular weekly read by French women was even claiming in mid-July: '' We love our curves''. Where are we going? Shopping in small shops and at open-air markets is still a very enjoyable experience. That’s where you find good food products. In Saint-Hippolyte, there was only one Boucherie-Charcuterie (butcher and deli shop). But it was a good one. Very clean, with refrigerated counters and a good selection of good quality products. A far cry from the butcher were my mother, sometimes but rarely because there was not much of it available and it was very expensive, bought meat in 1946, where it was laying in the sun, with flies all around. The butcher, a very cheerful man , and his very pleasant wife, was cutting all his steaks, beef stews, veal scaloppinis, lamb chops and leg of lamb himself, as well as duck breasts. Most of the pork and blood sausages he sold where home-made. And the chickens had been locally raised and slaughtered. Besides, he was selling a very good ‘’ pâté en croûte’’, some very good liver, duck, and country pâté, as well as a very tasty and unctuous duck mousse. He also had freshly roasted chickens twice a day, and that was very convenient. I bought 6 ‘’faux-filet’’ steaks (like a small New-York strip) weighing about 7 ounces each, for about 35 euros (48 dollars) and even though they were very tender and tasty, I thought that it was a bit expensive. Its is cheaper to buy fresh steaks in supermarkets, but the quality is not the same as in a butcher shop. There were 3 boulangeries-pâtisseries (bakery-pastry shop), but only one had very good artisan breads and croissants (1 euro per baguette and croissant). But the best store was a charming shop called ‘’ Entre Thym et Châtaigne’’ (between thyme and chestnuts) that was owned and managed by local foodstuff producers . There you could find beautiful fruits, vegetables, hams, honey and preserves, olive oil, cheeses, condiments, produced by farmers from the area. I bought some marvelous ‘’ Pelardon’’, a very tasty air-dried goat cheese from the nearby Cévennes mountains, and a smooth ‘’tomme’’ made from ewe milk. The Pelardon was the best cheese I ate during that vacation, and I regret that I was not able to bring some back with me. The Pelardon exists in 3 styles: Fresh, semi-creamy, and dry. I like the dry one best, not only because it has more pungency and personality than the fresh one, but also because it reminds me of the one we used to eat, along with raw ham and good country bread that we sliced with our ‘’Opinel’’ knives, when my godfather and I went hunting in the Cévennes, in the late fifties. But we also found good regional cheeses, home-made ‘’quiche Lorraine’’, and fresh pork sausage that we grilled on the barbecue, at the very lively open-air markets of Saint-Hippolyte and Ganges, where we also found some tasty locally-grown lettuce and tomatoes. These open-air markets usually take place once a week on the main square of the town, under the plane-trees. They have stands from regional farmers, grocers, spice and olives vendors, butchers, cheese and fresh fish mongers as well as people selling clothes, jewelry, mattresses, linens, cooking utensils, etc. The prices are usually a tiny bit more expensive than in supermarkets, but the variety and quality of the products is more authentic and better. At the Saint-Hippolyte’s market I bough half a litter of a great olive oil produced near Montpellier and distributed by a company called l’Olivette, for 10 euros, but it was one of the best I had in years, very fruity. My local supermarket the MONOPRIX at the corner of Boulevard de Grenelle and Rue du Commerce, still had a very good selection of pâtés, including a good pâté en croûte with a mousse de foie gras in the center, as well as very moist and tasty hams of all kinds that they would slice on demand. Their choice of lettuce and fruits was in fact better than what I had found in Montpellier and Saint-Hippolyte, and I was happy to buy tons of the very tasty and slightly crunchy bars of dark chocolate incrusted with tiny bits of cocoa beans from Côte d’Or and Nestlé that my wife loves and that I never found in Chicago. The fruit and vegetables stand Rue du Commerce sold very juicy peaches from Spain that were better and cheaper than those we found in the South. One of my favorite bakers, Kayser, rue du Commerce, still sold one of the best baguettes and 7 grain bread around, as well as ‘’real’’ croissants (1 euro each). My Nicolas wine store at the corner of Avenue Emile Zola continues to have a very good selection of wines from the Southwest. I particularly was glad to find a good Côtes de Duras, La Grave Bécharde, at less than 5 euros, and my dear Château Bellevue La Forêt, a marvelous Côtes du Frontonnais for 6 euros. But when I think about it, some of the wines I saw there were barely 2 or 3 dollars cheaper than what I would pay for them in Chicago. My butcher shop rue du Commerce had a new owner since the last time I was there 2 years ago. But its ‘’entrecôte’’ (rib steak) was as juicy and flavorful as ever. And his ‘’jambon persillé’’ (a ham sprinkled with parsley) was as good as any in Lyon. Next door, at my small fromagerie, the Cantal ‘’entre-deux’’ , meaning not too aged but not young either, was as perfectly aged as I remembered it. Who cares... I enjoyed so much eating all these good things that I will not have price increases destroy my pleasure of renewing acquaintance with French food products.